We all want the best for our home. Great replacement windows keep our homes well ventilated and protected throughout the year. If you’re looking for quality and stylish options, choose Renewal by Andersen® of St. Louis. The Andersen name is tied to customer satisfaction and superior window and door products. For over 100 years, Andersen Corporation has been building strong relationships both with its customers and other organizations in the industry. Aside from following the values of our parent company, Renewal by Andersen of St. Louis provides high-quality windows to the local community. For every project we do, we listen to what you have to say and respect every decision you make. We strive to meet and exceed your expectations. The Better Business Bureau has given us an A+ rating. This says a lot about our quality workmanship, excellent customer service, and top-of-the-line products. 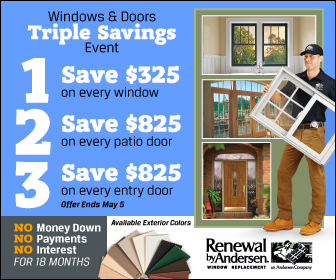 If you’re planning to get your windows in St. Louis from Renewal by Andersen, all you have to do is schedule a meeting with us to discuss what you need. Afterward, you can leave everything to us. Our entire installation process, from start to finish, ensures one-stop accountability in case there’s a problem. We will measure, install, and clean your new windows according to your exact specifications. Every window we install uses our patented Fibrex® material. This composite is twice as strong as vinyl and is an excellent insulator. Unlike vinyl, our replacement units are guaranteed not to warp with changes in temperature. Fibrex is also easier to maintain compared with other window materials. It won’t require painting or scraping, and neither will it decay or rot. The strength and durability of Fibrex makes it possible for narrower frames and curved specialty windows. It is also more environment-friendly and backed by a limited warranty. Window home remodeling in St. Louis, MO, is made easier and more convenient with Renewal by Andersen of St. Louis. With a combination of excellent service, beautiful and durable materials, and a systematic installation process, we st and out from the rest. If you want to learn more about our replacement windows, give us a call at (314) 332-2364 or fill out our contact form here.